Description Apply a shift to each trace according to a header value or a constant. 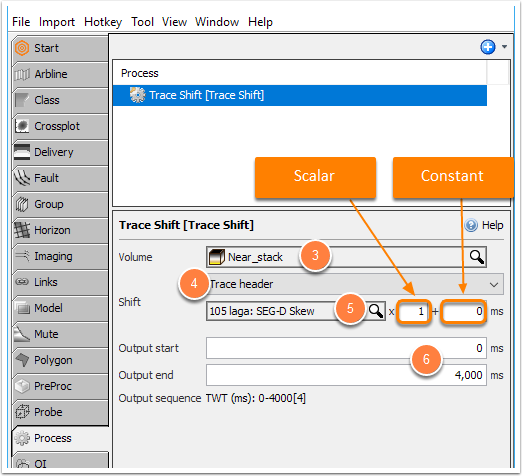 This process shifts each trace in TWT according to the value in a specified trace header. The shift amount can optionally be scaled by a multiplier and adjusted by a constant. This value will be interpreted as a shift in milliseconds, with a positive value moving the trace deeper (i.e. to a larger TWT). The process uses sinc interpolation to apply shifts that are not a multiple of the sample interval. 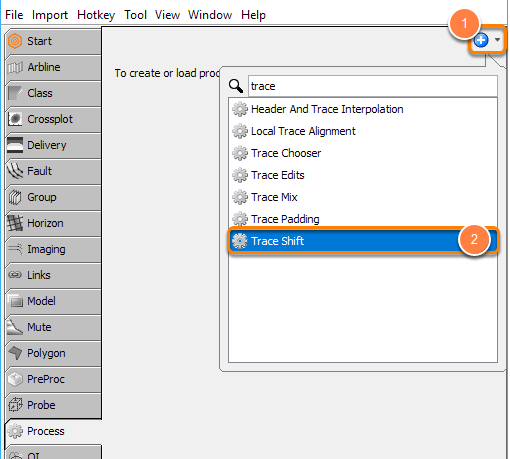 Select Trace Shift and type a name for the process. Select the volume to be shifted. Choose to shift by a Constant amount or Trace Header to calculate the shift from a header value. The amount of shift to apply (TWT) in milliseconds. Positive values shift traces deeper (increasing TWT). If Trace Header was selected, select the SEG-Y header containing the value from the drop-down list. Enter a scalar value if required. For header values in milliseconds, use a scalar of ±1 (the sign depends on the header). Enter a constant value to add to the scaled header value. The default is empty / no additional constant. Enter start and end times for the output traces. Output traces use the same sample interval as the input. This example applies a positive shift in milliseconds using the value stored in the "105 laga" header. For header values containing microsecond data (e.g. TCM), apply a scalar of ±0.001 to convert the shift to milliseconds. To apply shifts based on horizons, use Header Maths to load horizon values into trace headers.